Yes! There is a finished object in my house! What’s that you say? You don’t believe I finished a knitted item? Well… I would be insulted if it weren’t such a reasonable question. And true. Because actually the object was not technically finished by me. 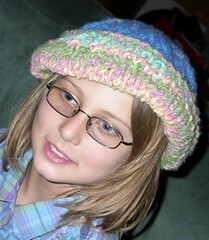 It’s the hat my daughter made for her teacher, and all I did was cast on and bind off.